A delegation of members of Government sent abroad on an offensive to counter Ambazonia claims that have exposed and sullied the image of the Government of Cameroon, especially its military, has submitted its report, which The Post procured. The mission was charged with: meeting the UN Secretary General, Antonio Gutteres, Permanent Representatives of member countries of the UN Security Council, Non-Permanent Members of the Security Council, the US Government and Legislators (Senators and Congressmen), Non Governmental Organisations among others. 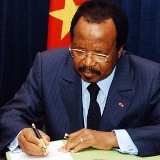 The mission was assigned to give Cameroon’s version of the situation in the country; brief them on the exact situation on the field; arrange for some diasporans to work with the Government, form pressure groups in Washington and New York, et cetera. It comprised Dr. Joseph Dion Ngute, Minister in charge of Missions at the Presidency; Paul Ghogomu Mingo, Director of the Prime Minister’s Cabinet; Felix Mbayu, Minister Delegate to Ministry of External Relations (MINREX) in charge of the Commonwealth; Oumarou Chinmoun, Director of American and Caribbean Affairs at the MINREX; and Susan Eyema Elinge epse Ewusi, Research Officer at the Presidency. The mission, in its report, stated that, at each audience, it briefed its hosts on: the evolution of the socio-political situation of the country; the atrocities committed by the secessionists on the civilian populations, government officials, traditional rulers and security forces; the violence perpetrated on public edifices and infrastructure as well as on private property. It stated that it was helped in the organisation of audiences by the Cameroon Permanent Representative to the United Nations, Tommo Monthe.